2015 couldn’t have ended in further success to Cuatroochenta. In the height of its launching in Sefici stores, incidents management app was meant to occupy an important position among the new productivity tools in business and administration; finalizing ad hoc projects for important customers on an international level; expanding the team with new colleagues to overcome 40 members; with an exhilarating horizon on fronts for 2016…and this week, with a new recognition: the Prize of the Innovative Company of the Valencia Region 2015, category of Business Career. This is what we can call a successful year. The award that recognizes the evolution of the company since its establishment in 2011 has been granted by the Network of European Centers for Innovative Companies (la Red de Centros Europeos de Empresas Innovadoras (CEEIs)) of the Valencian Region and the Valencian Institute of Corporate Competitiveness (Institut Valencià de la Competitivita tEmpresarial (IVACE)), under the Ministry of Sustainable Economy and Productive Resources of the Generalitat, in a ceremony held on Thursday December 17th at the el CEEI Castellón in the frame of an interesting Funding Forum for Innovation (Foro de Financiación para la Innovación). The founding partner and technical director of Cuatroochenta, Sergio Aguado, received the award desired by Cuatroochenta, as a winner of the provincial phase, along with other companies. In the category of Entrepreneurship, the new Valencian Company Compolinies, specialized in the design and manufacture of composites (Carbon-fiber, fiberglass…), won the award and we congratulate them right from here. Cuatroochenta se alza con el premio CEEI (El Periódico Mediterráneo). El CEEI reconoce el esfuerzo innovador de las mejores empresas de la Comunitat Valenciana(Levante de Castelló). 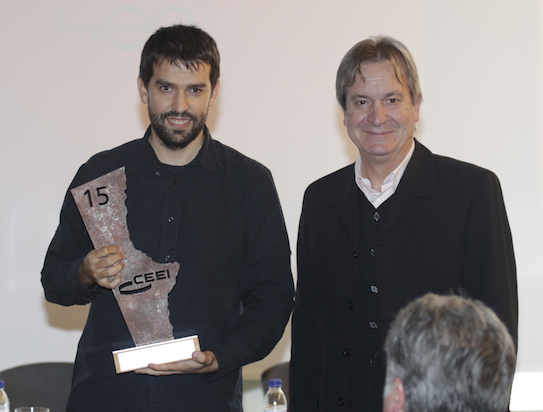 Compolinies y Soluciones Cuatroochenta ganan los premios CEEI IVACE Comunidad Valenciana 2015 (ElPeriodic.com).